Honestly, this probably won't be anything worth checking out. I could be totally wrong, but based on the name's and the set up it seems like a comic book Young Ones. I was hoping it would be something to do with Punk Rock Jesus, which was pretty entertaining. 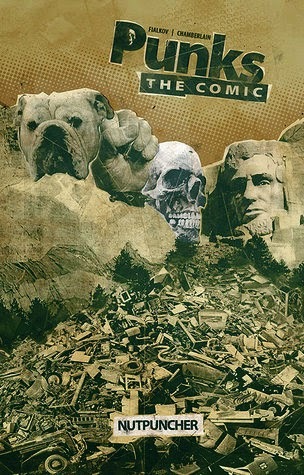 So, it seems, Abe, Fist, Skull and Dog live in a house and vomit and punch each other and murder gnomes, (OK, that sounds a little interesting unless they mean garden gnomes and then it's retarded). If that's all there is I'm not sure how long it could last. Even the Young Ones get old, (Bottom on the other hand is delightful). 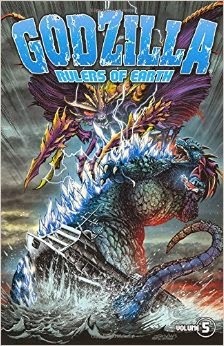 I actually like Godzilla movies, and movie monsters in general, but I look at these tie-ins, (comics, tv shows etc. ), and I can't help but get a little high and mighty. I don't know why. Anyone who's seen more then 2 seconds of a Godzilla movie know's it's nothing to take seriously and more often then not is actually quite bad. But, like all things firmly rooted in the letter B, (and sometimes Z), they have a charm and a "magic of movies" factor that always appeals to me. Looking at this fantastic cover and reading the plot outline, which seems straight from the best movie they never made, it might be time for me to reconsider these books. These tie-ins I have been, more or less, keeping up on. If you want to enjoy the games you basically don't have a choice but to read the novels and comics. 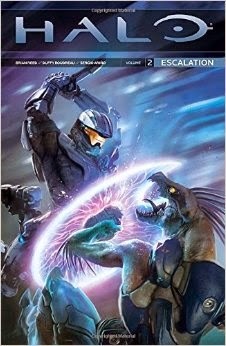 Like any sort of spin-off fiction the Halo universe is very hit and miss. I'm almost done Primordium, the second book in Greg Bear's trilogy, and I've had to force myself many times to just keep reading. On the other hand I enjoyed the first book, Cryptum. I've read most of Escalation and it's not too shabby. The artwork is a little on the Saturday Morning Cartoon side of things, which doesn't quite match the games, but the plots are engaging and legitimately add things to the Halo Universe. "vomit and punch each other and murder gnomes" SOLD!